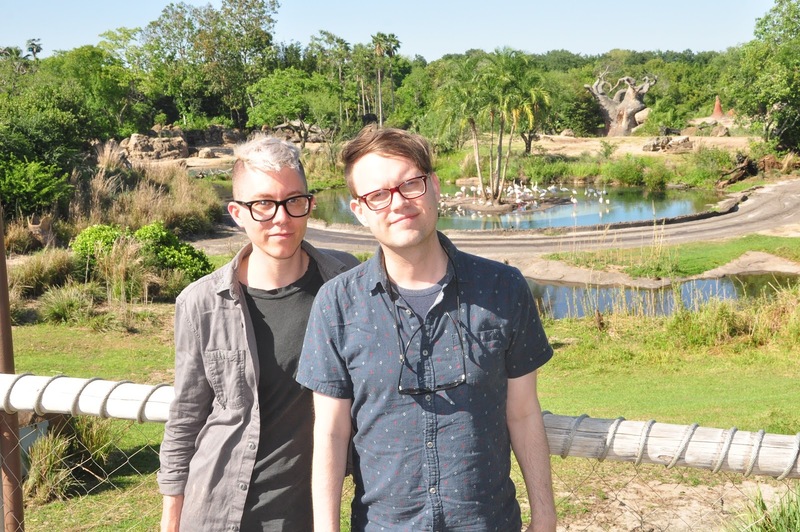 As avid Animal Kingdom fans, Adam and I have wanted to experience the Wild Africa Trek for years. After its debut at our favorite park several years ago, and the constant promotion on Stacey's "must do" channel in our hotel room, we finally decided to book a trek this past May. This is an upgraded park experience (aka $$$) and you are highly recommended to make reservations ahead of time. 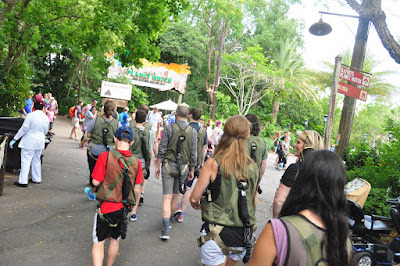 After check in you will be suited up in a snappy utility vest and harness with the help of one of your tour guides. Your trek "outfit" also includes a branded metal water bottle and name tag which are yours to keep. The vests are fitted very snug and tied around your crotch...so maybe not a good day for you to wear skinny jeans unless you're cool with everyone seeing your junk. 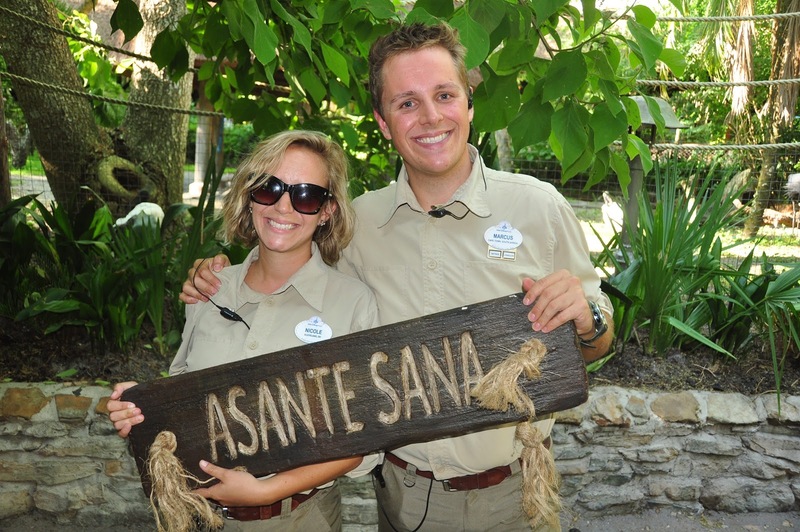 From here your group (usually 10-12 people) are lead by two upbeat and friendly tour guides through the Gorilla Falls trail on your way to the Kilimanjaro Safari stage. 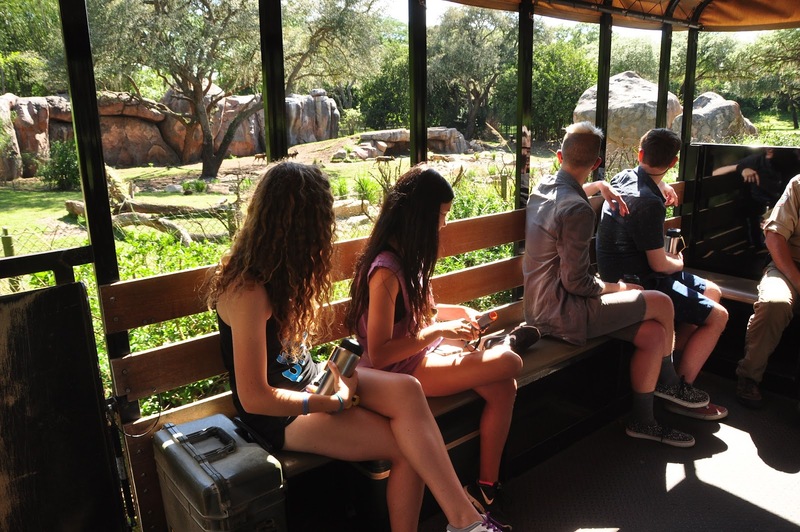 Like other Disney World tours, everyone in the group is outfitted with an earpiece to hear the tour guides speaking clearly, regardless of distance. 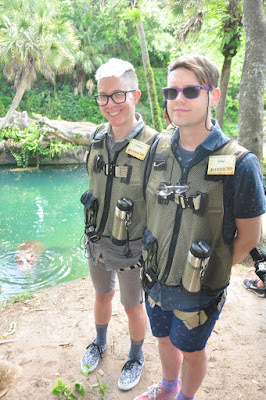 In the case of Wild Africa Trek, one tour guide speaks while the other snaps high quality photos, and they switch roles often. 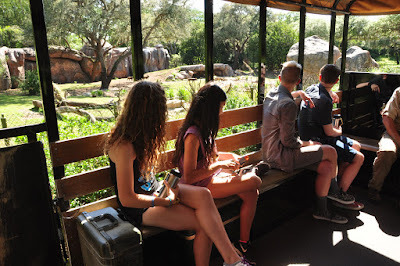 Though the time spent in Gorilla Falls was fun, the real adventure is at Kilimanjaro Safari. After walking on a trail behind the main stage, our first animal encounter was with a hippo. Here you are tethered via carabiner, and allowed to get VERY CLOSE to the drop off into the hippo pool. 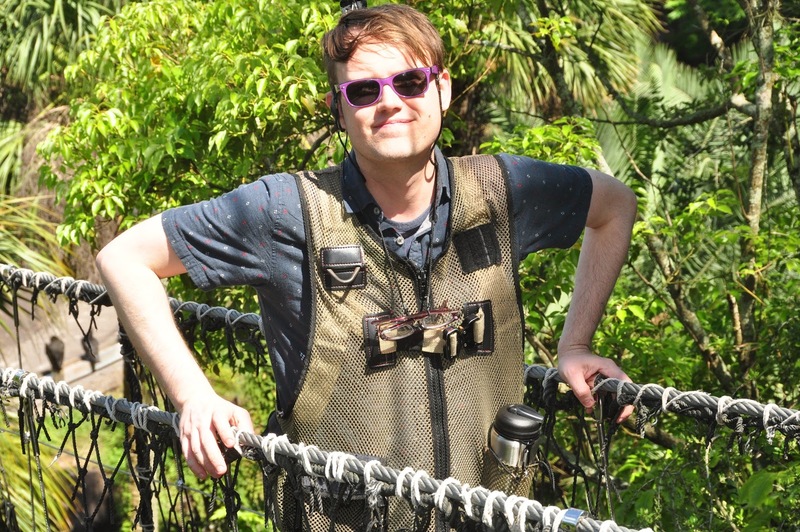 At this point a zookeeper appears to answer any questions about the animals. He was very knowledgeable about these animals and took with each question. 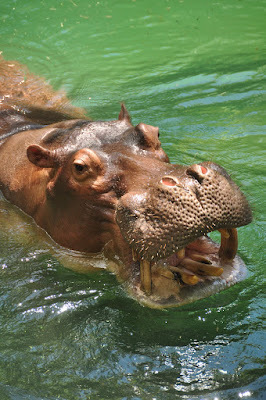 Oh yeah, they also entice the hippo with heads of lettuce...totally adorable. When people think of the Wild Africa Trek the first thing they picture is the crocodile bridge. 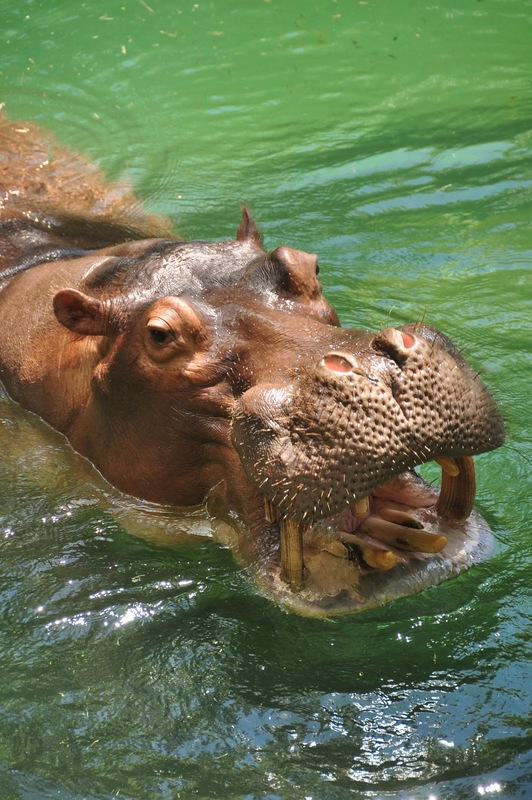 Like the hippo encounter, you are also tethered from behind to a wire above. So while it looks pretty dangerous, there is no real chance to fall in. 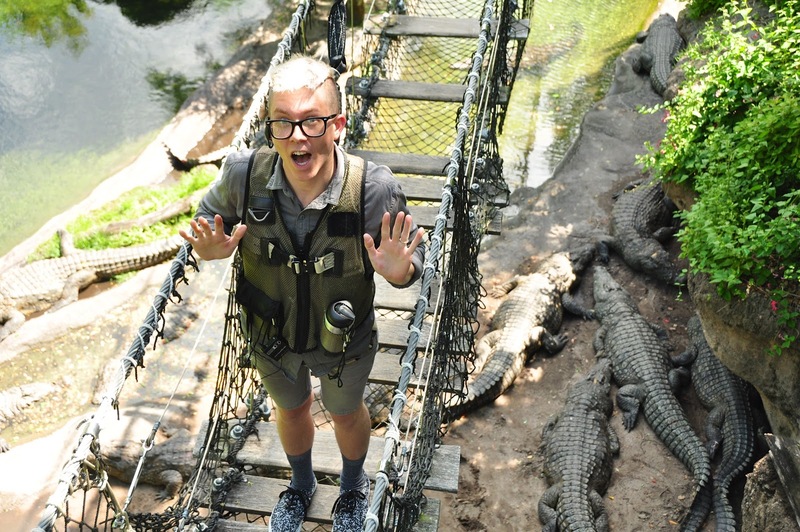 Trust me, Adam was basically jumping up and down on the bridge. Despite knowing that there is no real threat, the experience was actually pretty thrilling. In true Disney fashion the bridge is themed and faux time worn. 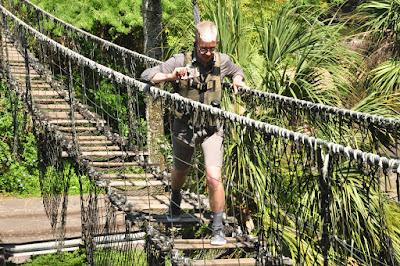 I appreciate this detail not as someone on the Trek, but as someone who sees this bridge (and other structures for the Trek...) as a guest on Kilimanjaro Safari. The props really don't take away from the main attraction at all. At this point another zookeeper is on hand to answer questions while you untether. Here you will board a jeep for the remainder of your tour. The jeeps are large and open, with bench seating. These aren't the same vehicles as you find on Kilimanjaro Safari, though you will be taking the same path (more or less...) from here on out. The most significant difference here is that the vehicle will stop on the side of the road so the guides can offer detailed descriptions, answer questions, and take pictures. While stopped your free to move about the vehicle for a better view. At this point we stopped for a light lunch at a themed structure built right on the savanna. (seen above...) With views like this, we could have been fed plain toast and water and still been elated. 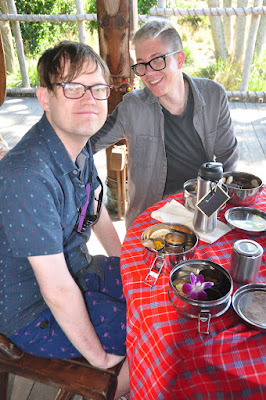 Luckily the food is provided by the nearby Tusker House chefs, whose food we enjoy quite a bit. As vegetarians we noted this fact when making our reservation, and was happy to see special veggie tiffin tins waiting for us. The dishes included a quinoa dish, tabouli, fruit salad, black eyed pea salad, curried Israeli cous cous, red pepper hummus and pita bread. If you have been to Tusker House before (or Boma at Animal Kingdom Lodge...) you're very familiar with all of these dishes. There is also water and "jungle juice/POG" available to drink. Though this is a a terrific feature of the trek, you shouldn't plan on this being your main meal. It was definitely enough to get us through the lengthy tour without starving, but afterwards we were ready to eat again. During an after your meal guests are encouraged to explore the views from the structure. (yes, there are restrooms here, and they're lovely.) As always, there is one of your tour guides available to take pictures. The space is a perfect and a great time to reflect on how lucky you are to be doing this. After "lunch" we boarded the vehicle once more to complete the designated safari trail. 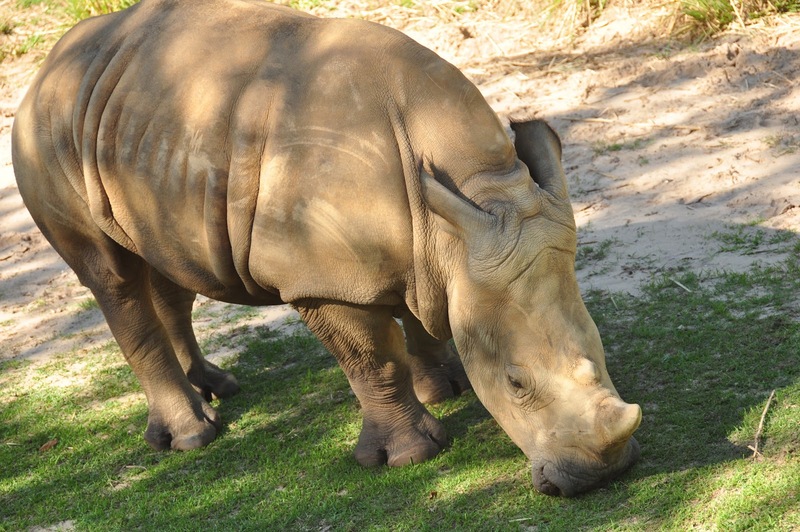 At this point we got terrific views of a few rhinos. 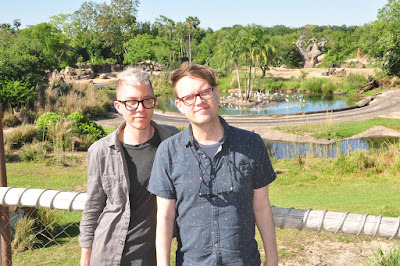 Unlike Kilimanjaro Safaris, we stopped to gawk for a good ten minutes. The rhinos were maybe ten feet from our vehicle, and our guides were happy to have each guest pose with them in the background. In addition to the water bottle/name tag, all of the photos taken on your trek are included in the price via online download. 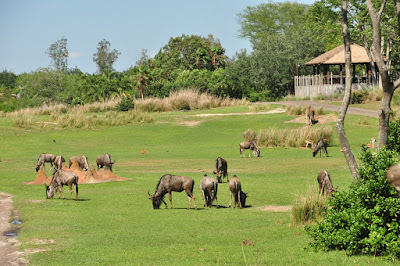 These photos are supplemented with some animal photos taken on the safari. The Wild Africa Trek is one of the best experiences I've ever had at Walt Disney World. It is such a unique experience, with a fun mix of adventure, magic, and Disney theming. Our guides were terrific, pleasantly off the cuff, and knowledgable of their topic. At more than three hours, and $250 per person (there are often discounts available...) this tour is definitely a commitment. But if the opportunity presents itself, don't think twice. Do it. Follow Along: Instagram, Twitter, Facebook, Youtube. This blog shows very important things.